Football is not just a hobby for Mitch Cotter, it’s his life. 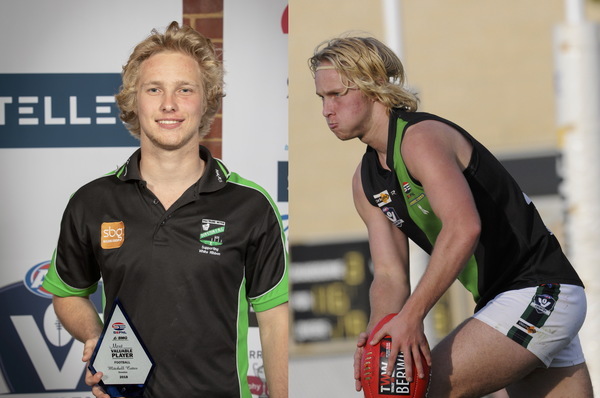 The 19-year-old Doveton star and former Dandenong Stingray is ferocious on the field, and committed off it – they are traits that will ensure he always stays in the hunt to play at the highest level. It’s little wonder that the inside midfielder is rated so highly after a sublime South East Football Netball League season – he has been a shining light, a player of immense character in a winless season for the Doves. But to him, his club won’t be down long – 2018 is just a speed bump for his team, a learning experience for all involved at AJ Robinson Oval. “We’re blooding a lot of younger players, which is great – but I guess on a Sunday after each loss you’re a bit down, but all the boys got around each other and kind of got us going throughout the year,” he said. “I reckon next year we’ll reap the rewards, and hopefully get back a few senior players too – those younger players will be more developed, so we’ll have a good mix. “At the start of the year, we thought we’d have a really powerful forward line with Riley D’Arcy and Taylor Joyce down there, but when both of them left, we didn’t know who was going to kick our goals, but players started bobbing up, Tyson Bellinger kicked a few, and some more midfielders got down forward. “It hurt us a little bit, but it’s made other players develop as well, which will benefit us. In a terrific top-age year for the Stingrays in the TAC Cup in 2017, Cotter was a consistent ball winner with a ferocious appetite to crack into the contest and win the ball for his team. From a statistical point of view, he was at the very top echelon of junior footballers. He was in the top five in the competition for tackles – at an average of over seven per match – and found the ball over 20 times a game on a regular basis, culminating in a top three placing in the Stingrays’ best and fairest. However, he was left disappointed after missing out on the draft despite being one of the competition’s best inside midfielders, despite the belief that he had done enough to justify a place on an AFL list in his one season. It’s eaten away at him since, and is still driving him to continually improve his game and off-field habits to ensure he can eventually play at AFL level. “My top age year at the Stingrays was solid, and my coaches thought I could play at the highest level possible,” he said. “I was a bit of an unknown going into that year (2017), to be honest – my game was based around contested possessions, and I probably needed to get more ball on the outside to pump my numbers up a bit more. “I didn’t have much connections or talk with the AFL clubs – watching a lot of players I played with or against now at AFL level is pretty disappointing for me, considering I know I can match them or beat them. “Seeing them get drafted was a bit annoying, but I have to just keep working to get there I guess. “I’m an electrician at the moment, and I’m working to play footy basically. “I feel like i’ve improved that part of my game this year (outside football) – it was a bit tough at Doveton obviously, but i was able to get on the outside a bit and get a few more marks in general play. Cotter played one VFL game for Frankston against Williamstown in Round 4 this year while playing senior footy for the Doves, and praised the impact former Western Bulldog premiership star Matthew Boyd has had on his game and to the overall development of his senior club. “I played the one game this year (at VFL level), and I thought I pretty good game and I found a bit of the footy, but it didn’t seem to work out, but having Matty Boyd down at Doveton has been great for me and hopefully it opens up a few doors for me at VFL level next year and beyond,” he said. In what Cotter describes as his “best year to date” on a personal level, the young star got the honour of representing the South East Football Netball League in interleague action on 19 May against AFL Yarra Ranges on top of his appearance with the Dolphins, and was one of the best on the field in the 36-point victory at Holm Park. His composure in what was a tough game of footy was particularly noticeable, and burrowed into packs against players who are more experienced and seasoned. “That was an unreal experience – the players at that level are just phenomenal,” he said. “That game was the highest level I’ve ever played, and I’ve played a game at VFL level. On Monday 10 September, Cotter’s unbelievable season was duly rewarded with two prized awards at the SEFNL presentation evening at the Cranbourne Racecourse – selection in the Team of the Year and the coveted SEFNL MVP, won in recent years by the likes of Bryce Rutherford, Scott Meyer, Chris Larosa and Madi Andrews. And that’s in his first year of senior football. An achievement quite extraordinary considering he edged out players who have been around the local scene for a lot longer. “To me, it was a huge surprise, I thought I was going to the night because of interleague, but it’s a huge honour – you want all the players and coaches in the league to respect you and rate you highly, and it meant heaps to me that they do,” he said of winning the MVP and being selected in the SEFNL Team of the Year. “It was terrific – I remember playing against Berwick one day and having Magner, Tuck, Rutherford and Madi Andrews up against me was an incredible experience, and to have the coaches of those teams like Berwick and Narre Warren respect me was huge. And just because the season is over at VFL and SEFNL levels doesn’t mean Cotter’s mind is not on football – he’s relentless in his pursuit to make it to the highest level. “I want to play as much at VFL as I can next year – I’ve already started my pre-season to build a massive tank to play at that level, and hopefully I can eventually get further than that,” he said.